Like Sunshine On The Rocks! Shaker One has been craving tacos all week. Well, actually I’ve been craving my home made spicy salsa. As I was making up a big batch of the stuff last night ( it’s so good I will eat it by the spoonful), I wondered what would go with it. I’m not a big beer drinker aside from the occasional Pacifico. There was a partially consumed bottle of prosecco in the fridge, but prosecco and tacos? I don’t think so. 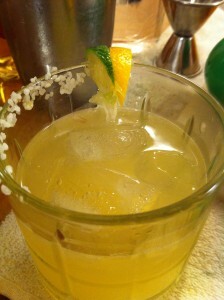 I pride myself with making an excellent margarita, always with fresh juice- no bottled “mix” stuff. So I made a batch of half meyer lemon juice and half lime juice (both freshly squeezed). Into the shaker that went with some tequila, triple sec and ice. A note on the Triple Sec/Cointreau/Grand Marnier debate: I always have triple sec in the house. I don’t always have Cointreau or Grand Marnier. That’s often the deciding factor for me. Now if you’re making a fancy dessert by all means get yourself some GM. And if you’re having a taco party (Taco Party!!) and want to make your guests feel special, pick up a bottle of Cointreau. It does have a more complex orange flavor than triple sec. But in a pinch triple sec is fine. Now back to the marg. Shake that baby up, strain into a glass and choose your garnish. I like my margaritas rocks/partial salt, so you can get a little hit of it if you choose without coming away with a mouthful on each sip. Balance in all things. Do note that the meyer is a sweeter lemon, so you won’t need as much of the triple sec to balance it as you would with regular lemon. And I did briefly consider making it will all meyer juice (no lime), but lime is such an integral component of a margarita that it just didn’t feel right. I took a sip and actually said “wow!”. Aloud. This is one delicious twist on the classic margarita. It is somehow fresher, with the sweetness of the meyer coming through nicely. I’ll be making these again, at least as long as the meyers hold out. I was recently at a friend’s house and she offered me a beverage. Knowing her gifts in the kitchen, I easily accepted to see what she had come up with cocktail wise. As she was pulling out various bottles, she handed me a little bowl of cherries and told me to try them. I’m game, so I popped one in my mouth, hoping it was not one of the typical sad little maraschino cherries… I really should trust my friends – it wasn’t. I could not quite identify the liquor they were soaked in. There was a bite along with the sweet cherry – but nothing too insanely rough to the mouth. She pulled out a jar and showed me the label. 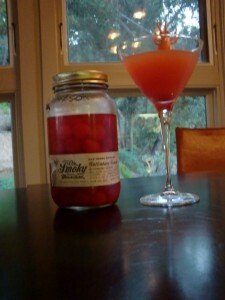 I had had my first moonshine cherry. 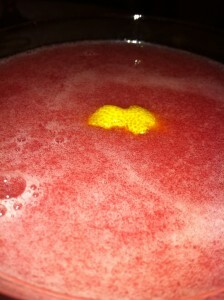 She had finished mixing up the drink and plopped a couple into the beverage and I took a sip. Lovely. This was her own concoction of a pomegranate martini that was really lovely.Pom liqueur, lime juice, vodka, orange juice and moonshine cherries. 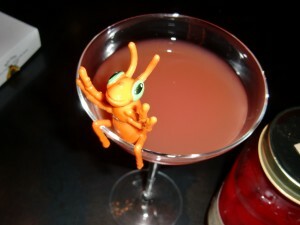 Being that we are both silly, as a nod to moonshine’s southern roots, she adorned the glass with a giant plastic insect. If you can find these babies, I say try them out. Merry Christmas to all our friends from The Red Shaker. Shake all of the above with ice, strain, pour, garnish with a sprinkle of cinnamon or nutmeg if you prefer. A couple of these and Santa will leave you whatever you want. 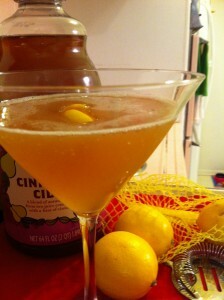 Creamy, luscious, not overly sweet- a delightful holiday martini. 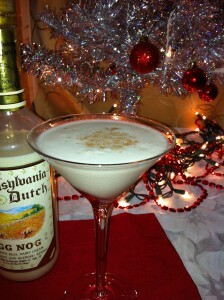 You get a subtle hint of the Chambord with just a bite of the rum/whiskey/brandy notes in the eggnog liquor. I made it with just plain heavy cream, but think it would be a knockout with a scoop of freshly whipped cream instead. This one is skating perilously close to 5 olives. Now we know why Rudolph’s nose was really red. This is my take on the classic side car. To complement the spiced pear cider I subbed in brandy for the more traditional cognac. Shake all the above over ice, strain and garnish with a bit of the lemon rind. If you can’t get your hands on meyer lemons you could use regular ones. But please search for the meyers…..they are a lovely addition to the pear. I can also see this delicious as a warmed beverage, served in a mug with a stick of cinnamon garnish. Grab some of the TJ’s Pear Cider. It’s a seasonal item, so don’t wait. The perfect way to use some of your leftover fresh cranberry relish. No, not that weirdly shaped stuff that gloops out of the can in one ridged gelatinous blob. I’m talking about what my Great Grandmother used to chop by hand (we’re all thankful for food processors! ), with fresh cranberries, navel oranges and a bit of sugar. My mom made this every year. And for those of you who want a shortcut, I’ve heard that Trader Joe’s now makes a good version, though I’ve yet to give it a try myself. I garnished with a whole cranberry and a bit of orange zest and shook in a few drops of cranberry bitters (you could also use orange bitters if you prefer). It’s like drinking Thanksgiving! One more tip: for a more festive bevvie, put a spoonful of the relish in the bottom of a flute and top with your favorite champagne or prosecco. Yesterday on Facebook we were discussing the cranberry liquor and someone suggested that you’ll achieve a superior result if you wait to add the simple syrup until the end of the process, rather than at the beginning. 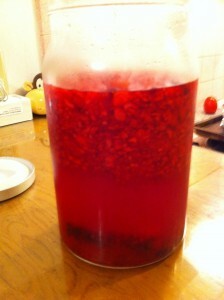 Basically you follow the same recipe, infusing the cranberries, spices and vodka for 4 weeks. At that point, you strain out the solids then add the simple syrup. This advice comes from “an old hooch maker”. Heh. I can see the merits of this, as you’d be able to control the level of sweetness/tartness better. But I’ve already started my batch with the simple syrup added. What’s a Shaker to do? Make a second batch, of course! Yep, I’m doing a head to head comparison of cranberry liquor techniques. Though Batch 2 will be 4 days or so behind Batch 1, I’ll do a side by side taste test at the end of each week. Check back later for updates. And a special thank you to my Hooch Making mentor! Did you guess? Shaker One has begun making her own cranberry liquor. 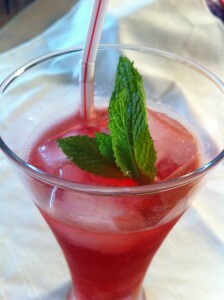 While browsing thekitchen.com at apartment therapy (I love that site, it’s a daily stop of mine), I ran across a post on making your own cranberry liquor. I love cranberries. My great grandmother would finely dice cranberries by hand to make her holiday cranberry relish (imagine the labor in the days before food processors!). 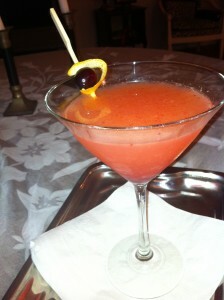 I like to make a cranberry martini using her relish recipe around the holidays. But when I saw the post I thought, ‘hey, wouldn’t cranberry liquor be a lovely addition to champagne? 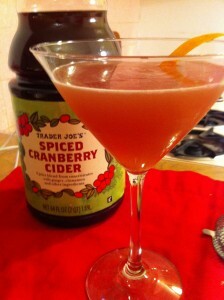 Sort of a holiday champagne cocktail!”……..so off I went to the store for fresh cranberries. The recipe couldn’t be easier. Simply add chopped cranberries and simple syrup to vodka and leave in the fridge for 3 or 4 weeks, shaking or stirring every other day or so. I added a cinnamon stick, a vanilla bean, the rind of part of an orange and a couple of cloves to give it a greater depth of flavor. The shot above is from day 2. Right away the cranberries imbued the liquids with a lovely deep red color. When I first mixed everything together all I could smell was the vodka. Now after 2 days I’m beginning to smell the cranberries as well. I can’t wait to sample it, which I plan on doing at the end of each week-just to see if any adjustments are needed. I’ll check back in in a week or two to let you all know how it’s coming along. 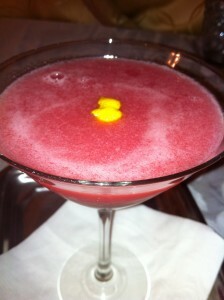 Of course, now all I can think about are cranberry champagne cocktails. Sigh. Oh well, I’m told patience is a virtue.